After Pantone Goe failed to catch on with its core audience of graphic designers and printers, the braintrust at Pantone realized there was still an unmet need in those communities. Also, the storied color matching system, PMS (Pantone Matching System), was crying out for a refresh. So Pantone took the best parts of Goe and the foundation of PMS, fusing them together to form the new Pantone Plus System. We got the inside scoop on Pantone from Giovanni Marra, Pantone’s Director of Corporate Marketing. To add a more diverse set of views, we also interviewed a select group of offset printers (Elk Grove Graphics, Darwill Press, Van Lanen and Lithographix) and ink manufacturers (Sinclair Ink Systems) to get their input. In addition to the new spot colors sprinkled throughout the spectrum, Pantone Plus introduces a slew of new swatches into the neon and metallics categories. This includes 42 new neons (previously there were only 14) for total of 56 neon colors. Also, 300 new “premium” metallic colors have been added to the already-existing 300. Just don’t toss away your current metallics swatchbook—these new metals stand alone in their own book, labeled “Premium Metallics”. The metals also have upgraded ink technology behind them. “The new metallics are a much higher luster and have a cleaner feel to them,” Marra said. “They are made with a higher metallic base than the old ink. These Premium Metallics are ‘non-leafing,’ meaning the metallic particles lay flat so they have greater brilliance and luster, especially when coated.” Also, the new neon colors have been moved, and are now located in the Pastels and Neons book. To offset (no pun intended) some of the costs of purchasing new swatchbooks (and to update your faded swatchbooks), Pantone has initiated its Chip-In program, where you can get a $25 rebate for every swatchbook ($50 for chip books) you exchange when purchasing the new Plus system swatchbooks. After a detailed look at the Plus system and swatchbooks, here is our take on it. [Full disclosure: Pantone provided Hexanine with a set of Pantone Plus swatchbooks for review.] Overall, we are very pleased with the new colors and changes that make up the new Plus line. Pantone seems to have taken the best parts of the existing PMS and moved them forward to provide more options for everyone—designers and printers alike. And what designer doesn’t want more color options?! We applaud that Pantone has carried over its “Color Checker Light Indicator” from the Goe line, at the back of the swatchbooks. 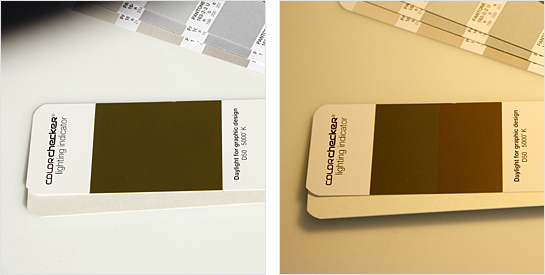 The checker is a set of two colors that look identical in corrected, neutral “daylight”, but color shift apart if viewed under poor lighting conditions that will affect color viewing. This is especially helpful for designers with color-sensitive clients who like to look at proofs and pieces in fluorescent or incandescent lighting conditions. Our critiques of the Plus system are relatively minor. The new swatchbook color arrangement isn’t a big issue—after all, most designers will be searching visually (by color) anyways. But it would have been helpful to see which colors are newly-added, as a quick reference. As it stands, there is no easy way to know the difference, except to view the old PMS and new Plus swatchbooks side-by-side. Some sort of subtle notation within the Plus swatchbooks would be much-appreciated. The new metallic colors are welcomed, and serve as a much-needed addition to that part of the Pantone line. We are excited to have so many new options in that arena. But on the flip side, referring to the neon additions as “new colors” seems like a bit of an exaggeration. The new colors are more like tints of the 14 original neon colors rather than completely new hues. Whether this was an ink technology hurdle or just a weak effort, it falls short. It would have been nice to have some truly different neons. The Plus system also lets you download the color libraries for use in the Adobe Creative Suite apps and QuarkXPress with the Pantone Plus Digital Libraries software. The color libraries are simple to download and install, and you don’t even need to restart your design applications. While these libraries are available for download on the Pantone site, we were dismayed to see a confusing message when registering our new swatchbooks. 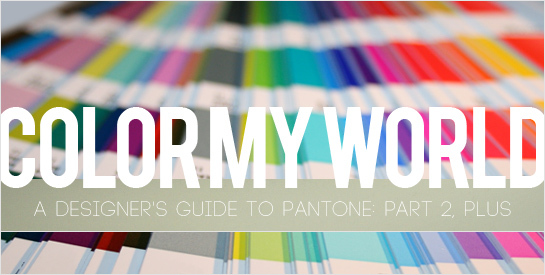 (You can now register your swatchbooks on the Pantone website.) The registration site and confirmation email gave us following error in red type: “We apologize that the installer for Adobe Creative Suite is not yet available. Please check back in a few days.” This inaccurate and unfortunate programming hiccup will probably confuse early adopters, since the color libraries are available elsewhere on the site. This problem could frustrate designers who register their swatchbooks, and could mistakenly slow use of the Plus system by designers. In the end, we believe that Pantone has respected the legacy workflows of PMS while injecting some needed energy into their color matching system with a bevy of new colors. Pantone Plus seems like a worthy successor to the PMS system, and unlike Goe, designers and printers can basically keep all their entrenched practices intact. Todd Petzak, of Van Lanen, summed up the future well: “As printers, we are open and ready to implement these colors. Designers are the ones that will drive the popularity.” We see no reason why designers and printers won’t adopt the new system wholeheartedly with their next upgrade of swatchbooks, and add a whole lot of color to our world. 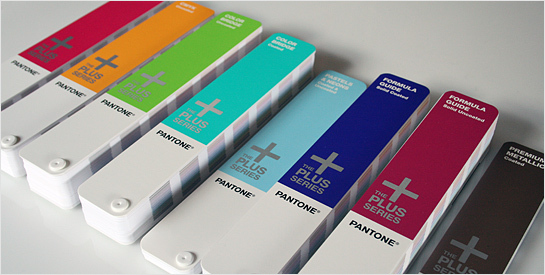 Have you had experience with the new Pantone Plus system? Or have additional questions? Please weigh in with your comments below. Thanks! Very comprehensive article as it’s good to hear all sides of the story on this one. Seems like Pantone made a nice rebound from the short-comings of Goe to give us a smarter tool in Pantone Plus. I had a quick peak at the system a few weeks ago and I loved the logic they’ve brought to the table. However, I agree that it would have been great to know what colors they’ve come up with to fill in the gaps. Maybe an icon or something;) Of course there will be a lag while everyone gets their books up to speed, but I give them credit for having an exchange program to help cover the cost a bit. As print designers, we’ve been asking for more colors for a long time — now it’s our turn to elevate the game. I would like a price to purchase the pro Interior designers swatch books for colour consultancy appointments.